I am about to put a new firewall in the roadster and have a question. Does the firewall have welting around it? The one in the car has welting and it makes the rear hood hooks hard to hook. It also has a new radiator that doesn't fit right. It works great and fits everywhere except the mount on each side. I measured the bolt holes in the frame at 21 5/8" C/C. 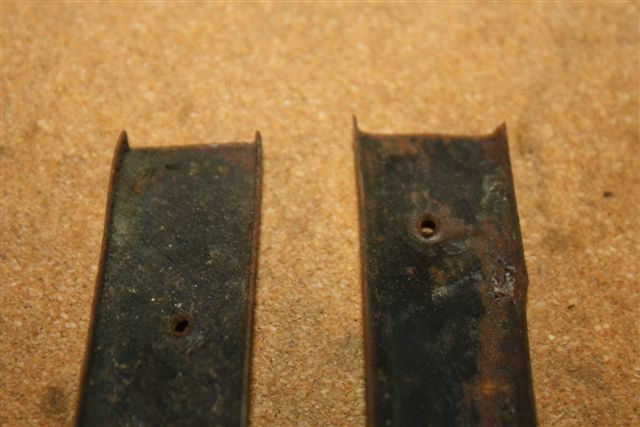 The shell holes are 21 5/8" C/C. The holes in the radiator mount are 21 1/4". I just would like to know if anyone has experienced this and if so, who built the radiator. I modified the mount and it works great now. Not long ago there was a similar post. The front cross member has likely flattened and spread due to weight of the engine and a rough life. It will need to be reshaped. Most recommendations have been to use a chain and hydraulic jack to accomplish this. 21 would also have the rain gutter on the top along with the welting. Your springs on the hooks might be too stiff or the blocks were not installed correctly. There should be a recess on the bottom of the blocks for the spring to fit into. There are actually 3 pieces that fit around the edge of the firewall. There is the rain gutter that fits around the top and around the sides till the firewall straightens out. Then there 2 pieces of sheet metal channel that fits over the exposed edge of the wood firewall. One on each side. They just nail on, and have useally fell off most cars. Ill try to post some pics of them tomorrow. Also does your firewall have some notches at the area the hood hinges meet the firewall on each side. 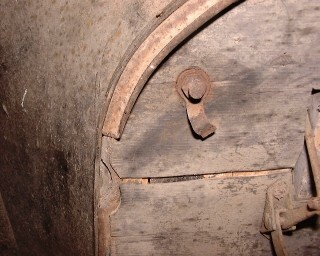 I believe they are a semi-circle shape and are there for the hood hinge to have a little clearance. Not sure if all the firewalls had them or not. If you notice on the closeup of the side pieces, you can see where the welting has protected the paint and shows a outline of the welting. The side pieces nail on with the welting. I had a very original 21 that still had the side pieces on it. They are almost always missing from restored cars. They are made from very thin sheet metal. They also fit under the ends of the top rain gutter by about 1/8 inch on my car. There probabley was no real measurement used. The guy installing them just stuck them in there and nailed away. The guy on the other side of the car, probably did his different. Some may have just been butted together as no two cars are alike in the small details ... If you need to see what the notch looks like let me know and Ill try to find a original to take a pic of. Forgot to mention, I agree with Dale about the radiator holes. The front crossmember has probably sagged or been bent. You straighten it by bolting a strong chain to each hole where the radiator studs mount. If your holes are too far apart, leave enough slack in the chain to set a hydraulic jack on top of the crossmember and let the chain go over the jack. By putting pressure on the jack it will pull the holes back in alignment. A few good "wacks" with a hammer on the front of the frame and also the crossmember helps to "settle" everything into place. Do not beat the crap out of it, just a few well placed blows using good judgement. If the holes are too close together let the chain hang below the crossmember and put the jack under it. Just be carefull. Note that the welting is approximately half the width of the cap. This is so it does not cover the notch in the firewall (which is approx. half the depth of the firewall) that accommodates the hood hinge. Therefore, you should use 3/8" radiator cowl lacing for the welting and not the 5/8" welting sold by the vendors. The firewall top cap and the side cap are in three pieces because on each side they are separated by the notch in the firewall. In other words, the pieces posted by Donnie Brown do not touch each other when actually installed on the firewall. Dale, I checked the measurement on the mounting holes and they are correct. 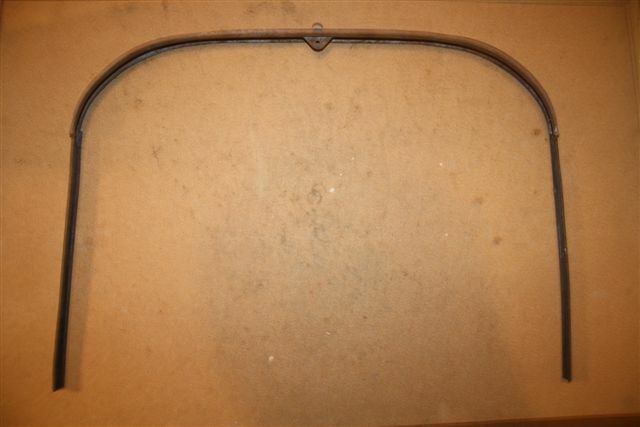 The holes in the shell even correspond with the holes in the frame but, the holes in the radiator mounting plate are not correct according to the original pieces. I considered the spread, that is why I measured them and checked it. The discrepancy is in the radiator mounting plate. As I mentioned, once I modified the mounting plate holes in the radiator, everything works great. Right now I just am trying to figure out who made this radiator. Donnie, do you or anyone know where I can get the metal cap? I would like to put this car back in good shape and be correct. The firewall I bought has the beveled edge and the notches for the hinges and even is notched and beveled for the mag horn, which I have. Sounds like you have a dash/firewall for 15-16 and might be hard to get the parts to fit. The dash/firewall with a beveled edge was used under the hood support/cover on the last of the brass radiator cars. If in deed it has a beveled edge you will need to get the correct dash before you mount it. I stand corrected on the placement of the lower cap. It does sit below the notch as Erik stated. It had been several years since I had my 21. I have a piece of original firewall with the cap still attached and it sits below the notch. The remaining welting on it is also narrow as he stated. I did not have a camera with me when I was at the other shop or I would have taken a pic. Bob do you have a repro set of 3 or are they original. I did not think they were being reproduced several years ago. Just wondering if they are in repro now. Mark, the firewall I am going to use is the one listed for the car in Snyder's catalog and came from them. What part of it is beveled? If it's the outer edges they may have sent the wrong one. The outer edge should be flat and at right angle to the front and back. Or I am misunderstanding what you mean by beveled. The wood firewalls for 1917 model year and forward SHOULD have a beveled outside edge per original examples as well as the Ford factory drawings as well as the other items mentioned by James such as the hood notches and bevel for mag horn. As far as I am concerned, the wood firewalls from the vendors for 1917 through 1921 are not correct as they are missing details. I believe that the vendors all use the same supplier for the firewalls. My dad purchased a firewall from Lang's for his '17 touring. 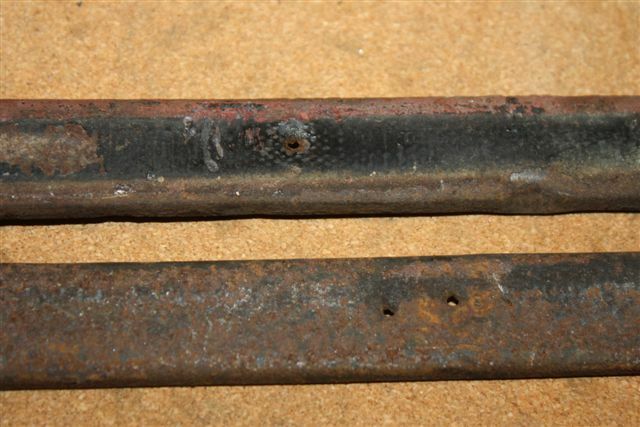 However, the Langs firewall was "generic" and required a lot of additional operations in order to make it correct for car including putting a bevel on the outside edge, adding a bevel at the bottom edge for the horn, adding the notches for the hood hinges, re-doing the carb-rod slot, etc., etc. (All the existing holes in the Langs dashboard are in the correct location and the correct diameter per the factory drawing.) We had two original 1917 firewalls as well as the respective factory drawing as a reference to make the corrections. Man when I am wrong, I am wrong! Went back and looked at a photo of the dash that was on the 21 when I got it, yes it is beveled. The 15/16 dash is beveled as is the 17 but the 15/16 also has radii at the front and back to accept the underside radii of the metal hood former that slides over the dash completely along its outer top and side edges. The dashes that most dealers carry are generic and you will indeed have to add missing details and those too are not generic since like all other T parts there were running changes being made from beginning of model year to the end. James, I still have the org.firewall I took out of my 22 if you want to use it for a pattern. Thanks Randall, I have a new firewall from Snyder's that looks good and is cut correctly, it's just the metal trim and welting that is wrong on the car. 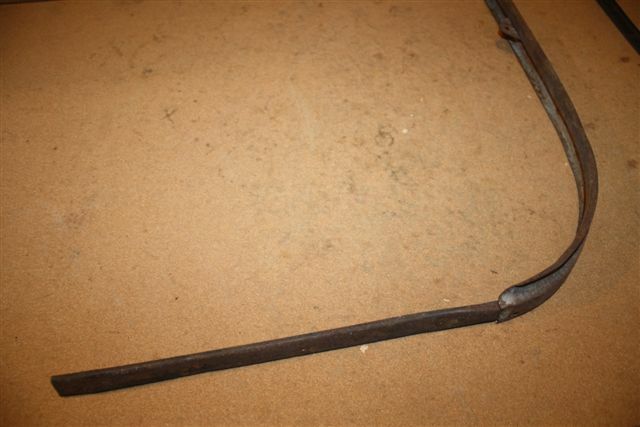 I have contacted Bob and bought the metal and will work it so it will fit.